BER U22 NEOS 4.5" STS. Designed and manufactured in the USA, the U22 Neos Inox is a single-action .22 LR caliber plinking semiauto pistol. Although designed with the entry-level shooter in mind, it is also ideal for training and can be adapted to the needs of experienced users. Its modular construction makes it easy to modify with a variety of options and accessories, while still being affordable both as a base pistol and as a fully-accessorized system. And the ultra-durable stainless finish makes it particularly easy to maintain, meaning that it will give you hundreds of hours of fun while requiring only minutes to clean. The Neos is constructed of five modular parts that may be easily disassembled and reassembled without any tools. 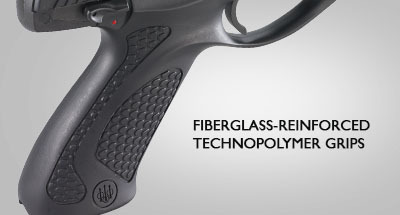 The ergonomic grips are constructed of super-durable fiberglass-reinforced technopolymer with non-slip inserts for a comfortable and warm hold. Most of these elements may be replaced with the rich assortment of accessories that is available for this fun .22 semiauto. Reliable, durable, easy to maintain and remarkably accurate, the Neos features an integral rail that accepts Weaver-style scope mounts as well as a fully-adjustable target rear sight. 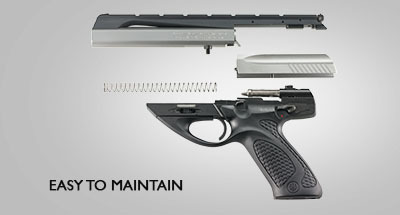 The firearm is also equipped with a cocked firing pin indicator at the rear of the pistol. The single stack, 10-round stainless-steel magazine features an easy-grip knob that allows you to compress the spring from outside, thereby making loading extremely quick and easy. 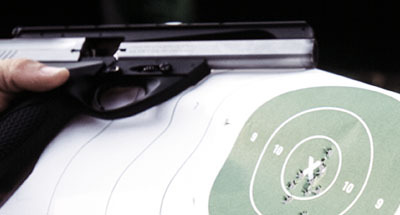 The ambidextrous manual safety can be engaged with the firing pin cocked or uncocked. If you are in the market for a superbly-engineered plinking or practice pistol, give the Neos a close look--it won't fail to surpass your expectations.